One great thing about Saturday mornings with a house guest are the excuse to go all out on breakfast. 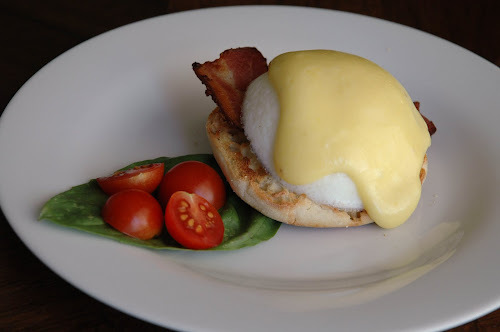 With English muffins, eggs, bacon, and butter on-hand and a new kitchen tool (egg poaching cups) I set out to make Eggs Benedict, something I've made maybe once before. At the heart of this dish is Hollandaise Sauce . 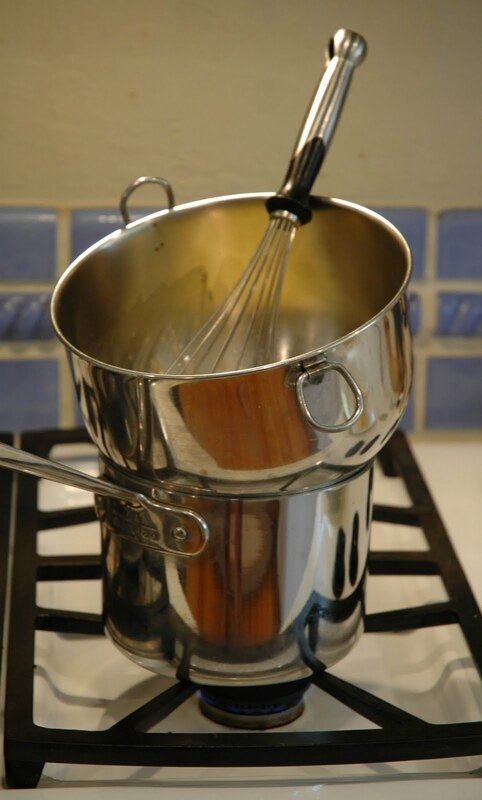 . . a relatively simple recipe, however, it can be a little tricky because the emulsified sauce can be difficult to form and even if you get it right -- can easily break. As a first step you'll likely want to refine one of your ingredients. Butter is thought of as fat, which it largely is, but it still a mixture of milk components, roughly: 80% fat, 18% water, and 2% milk solids (proteins, lactose, salts). When you lightly heat butter in a sauce pan (above, TOP) you cause the water to boil away and the solids to coagulate . 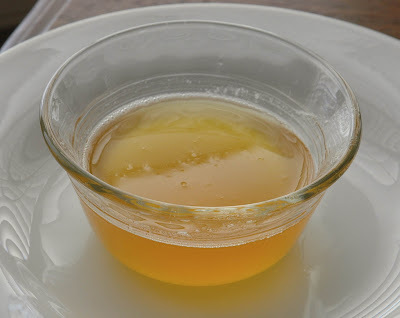 . . when you skim these solids away you'll have "clarified butter", a purer butter oil (above, BOTTOM). The product known as ghee is similar, but is typically heated longer which imparts a brown nutty flavor and works well with Indian cooking. 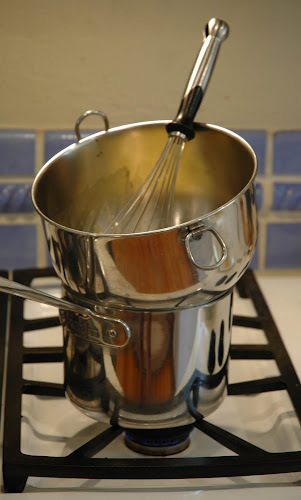 For heating the sauce I improvised this double-boiler set up. You start by whisking three egg yolks and some water together. 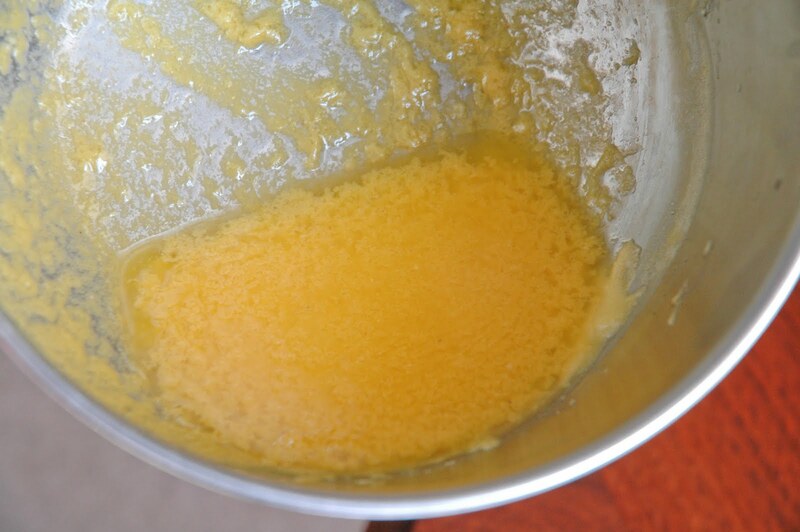 Egg yolks contain fat (12%), water (45-50%), protein (16%), and surface-active components of lecithin and cholesterol. 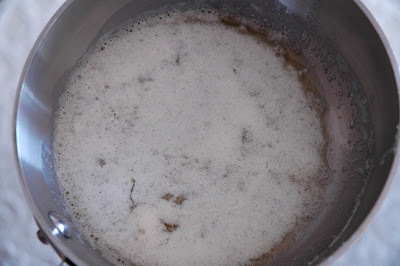 It is primarily the role of the lecithin to help stabilize the oil-in-water emulsion by aligning its oil-loving portions toward the fat and the its water-loving parts toward the water. The clarified butter is then added slowly in a small stream, making periodic pauses to incorporate the butter before adding more. Managing the temperature of the sauce is very important, you must keep it warm enough to keep the fat liquid and so it incorporates into the emulsion, but not so hot that the sauce breaks (more on this later). Lemon juice, white pepper, and salt added for flavor. 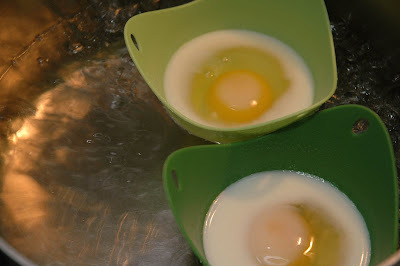 To poach the eggs I used silicone cups made just for this purpose. The eggs neatly bobbed along in their boats simplifying the poaching operation somewhat, since the water didn't need to be swirled just right . . . however, they did take-on a slightly manufactured appearance. While still delicious with a runny center, aesthetically they were a little too uniform for my taste. At the moment I was ready to proudly serve this ephemeral goodness I realized our house guest had disappeared to the shower. What I didn't do well was keep the Hollandaise sauce in that band of temperatures between not-too-warm and not-to-cold . . . I let it cool too much and then when our hungry guest reappeared I reheated it too fast and too hot, which caused the proteins to curdle and the emulsion to break. 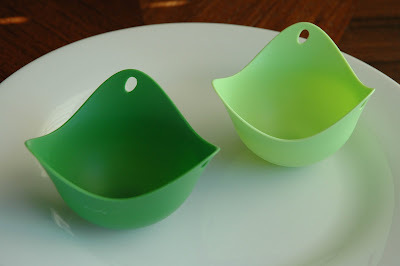 Next time I'll place the bowl in a surrounding tub of warm water to maintain temperature. Eggs Benedict FAIL: overheated, broken sauce. Not very pretty. 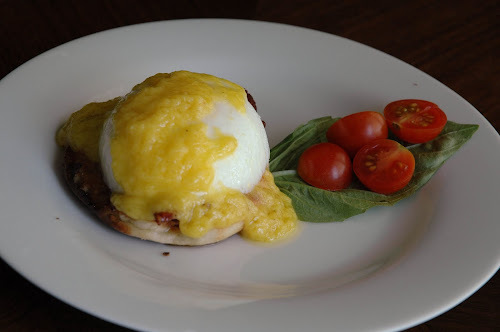 Eggs Benedict WIN: a softly poached egg on an English muffin with bacon, creamy Hollandaise sauce and a bit of basil and cherry tomatoes as a garnish. 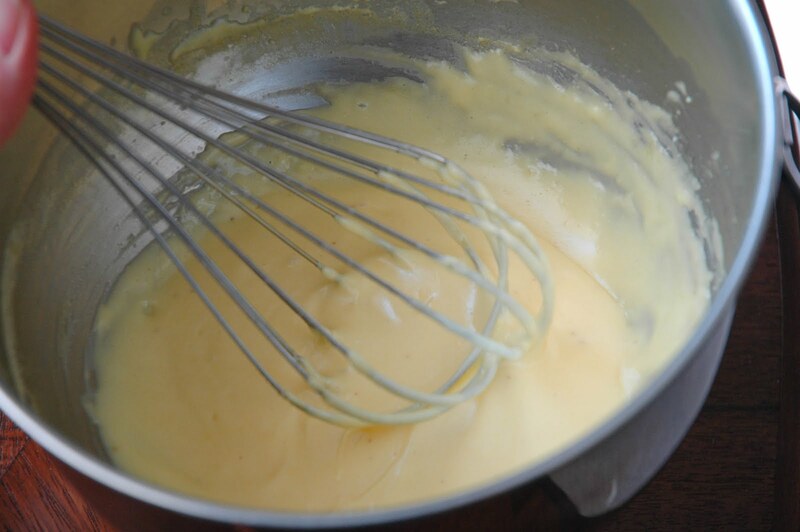 Thanks for such a great description and such great pictures about how to do a great Hollandaise. It's one of those sauces that's very fragile and takes a fair degree of skill to do successfully. In order to keep the Hollandaise sauce the perfect temp for a period of time, my mom pours the sauce into an insulated travel coffee mug (just make sure it is very clean and doesn't smell like coffee). Then, you can just pour the sauce out of the drinking spout when ready.